The National Handicrafts and Handlooms Museum (NHHM) popularly known as Crafts Museum located at Pragati Maidan in Delhi. The museum displays the extraordinarily rich handicrafts of artisans from all over the country. This is one of the largest craft museums in India, which houses a collection of 20,000 items of folk and tribal arts, crafts and textiles. The craftsmen from all over India come here to display their skill, competence and talents. The Crafts Museum started in the year 1956 with an objective of showcasing the work of different artisans. Today it has some of the finest collections of crafts in the country. 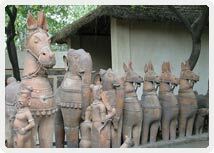 It is also famous for the artistic display of various Indian village arts works. The museum is divided into the number of galleries based on a theme such as Textile Gallery, Gallery of Courtly Crafts, Tribal and Rural Craft Gallery, Gallery of Popular Culture and many more. The museum also exhibits arts of various villages through wood and stone carving, paper mache, ivories, dolls, toys, puppets, masks, jewelry, decorative metal ware, paintings, terra-cotta, cane and bamboo work. An installed ‘Visual Store’ is a perfect reference for the displayed handicrafts. Approximately, 15,000 things are displayed in this category that provides a great deal of opportunity to acknowledge with various crafts of India. The museum was designed by the renowned architect Charles Correa, who tried to recreate the charm of an Indian village street. 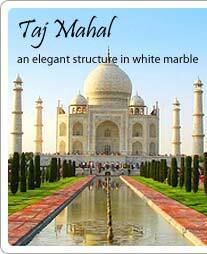 During the visit to this place tourist can buy various crafts as a souvenir of their Delhi Tour. July to September: 0930 am- 5 p.m.
October to June: 0930 a.m. to 0600 p.m.